Living Into A New Story: My Day With ServiceSpace! I woke at 4:30 am, did my yoga, some quick chanting and meditation, and was on the road by 6:00. My traveling companions were Rick, an architect, and his wife, Donna, a veterinarian and healer. 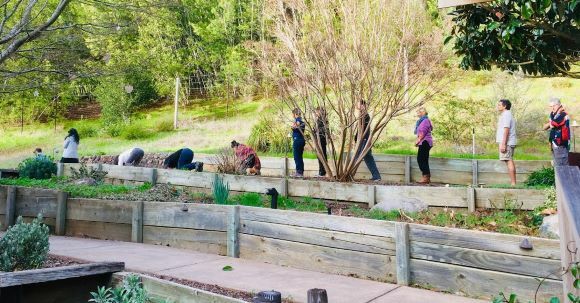 Our destination was a retreat in Marin County, sponsored by ServiceSpace, an all-volunteer organization whose goal is to encourage everyday people (that’s us!) to contribute in meaningful ways to the world around them. The shepherd of ServiceSpace is Nipun Mehta, a man whose exuberant energy is infectious. He believes in the inherent generosity of others and draws it out of them through the sincerity of his own generosity. Five minutes after you meet Nipun you feel like family. He radiates a positive energy that fills up a room. 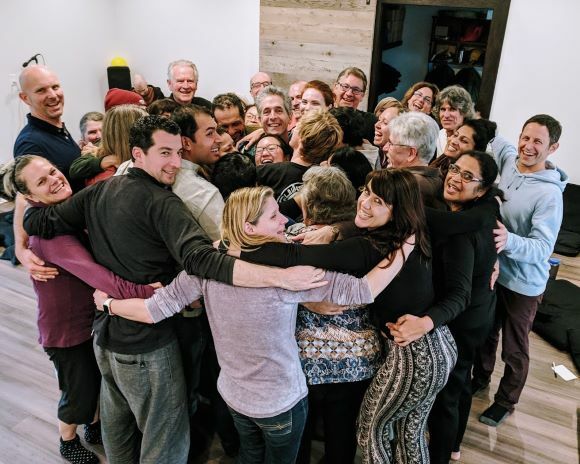 When he wraps his powerful arms around you in an embrace, you know this is a guy who is totally present, who practices loving kindness in every interaction with each person he meets. So when he asked me to lead an all-day workshop on Hands, Head, Heart: A New Story, I couldn’t refuse. How can you say no to someone who never says no to others? “No” isn’t part of Nipun’s vocabulary. His life is all about yes! So what could I say? I said yes. 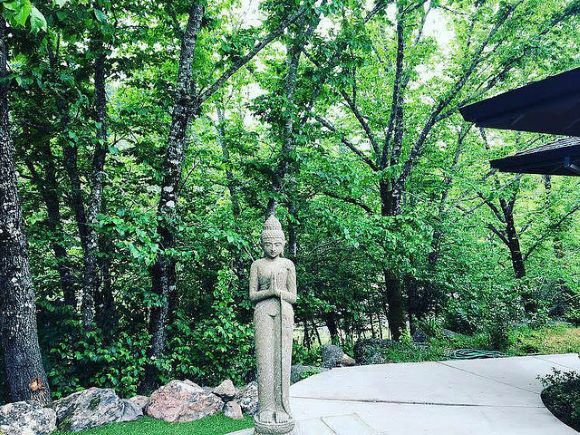 The workshop was held at Banyan Grove, a beautiful retreat center that was gifted to ServiceSpace in August of 2017. 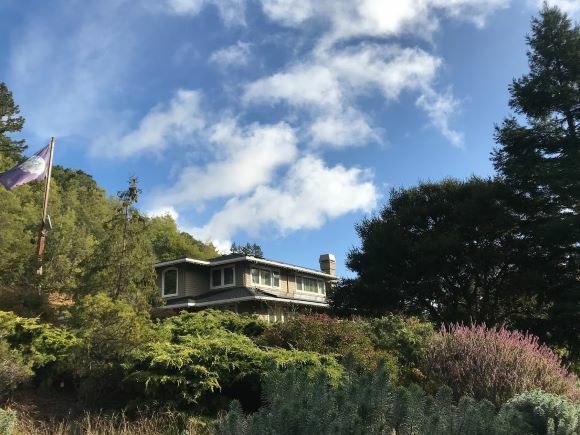 Located in the small town of Forest Knolls (in the shadow of Serenity Knolls where Grateful Dead guitarist Jerry Garcia breathed his last breath), the center consists of a main house, a zendo, a dormitory building, a small cottage, an outdoor patio area, and a generous amount of natural acreage encircled by redwoods in a forested section of Marin County. The Banyan Grove is a reference to the grove in Bodh Gaya, India, where the Bodhi Tree stands, under which Shakyamuni Buddha attained enlightenment. The Banyan Deer figures prominently in a Jataka tale about a deer who is willing to sacrifice his own life to save the life of a pregnant deer. In the process, the Banyan Deer convinces a venison-loving prince to become a vegetarian who vows never to harm another living thing. After crossing the Golden Gate Bridge, we stopped at the Starbuck’s in Sausalito for a soy latte. Wired for sound, we got back on the road and Rick navigated us expertly to Sir Francis Drake Boulevard through the towns of Larkspur, Kentfield, Ross, and San Anselmo. In downtown Fairfax, we yielded to three deer crossing the road (the Banyan Deer?). Apparently, in these small hippie towns, it’s not just chickens who cross the road to get to the other side. More meditators are trying to get to the other side in Marin than in any other county in California. Which became evident as we passed the entrance to Spirit Rock Meditation Center a few miles up the road. At the entrance to Spirit Rock stands a massive stone formation that looks like a small version of Ayers Rock in Australia. Only a few minutes past that spirit rock, we turned up a meandering road and pulled into Banyan Grove, right in the heart of this spiritual vortex. We tumbled out of the car and hiked up to the main house. 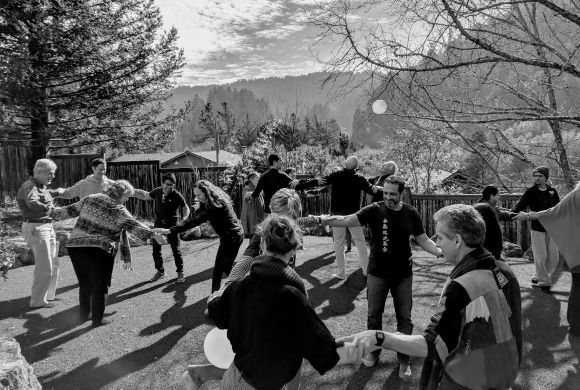 There, nearly forty people—most of whom arrived the previous morning for the first day of the retreat—were beginning to gather. They clustered in small groups, eating breakfast and engaging in spirited conversations. The first person I met was Jordie, an enthusiastic young man from Melbourne, Australia, who was brimming with joy. He sat next to Akshay, a vegetarian from birth, whose perpetual smile put me instantly at ease. Within minutes of my arrival, I felt like a valued member of the ServiceSpace community. After eating a small bowl of oatmeal, Nipun arrived and welcomed me with his customary hug and bright smile. Then he set me up in the small cottage where he had just completed a 30-day meditation retreat. In the solitude of the cottage, I was able to rest up a little, review my lecture notes, and practice some of the stories I would tell throughout the day. 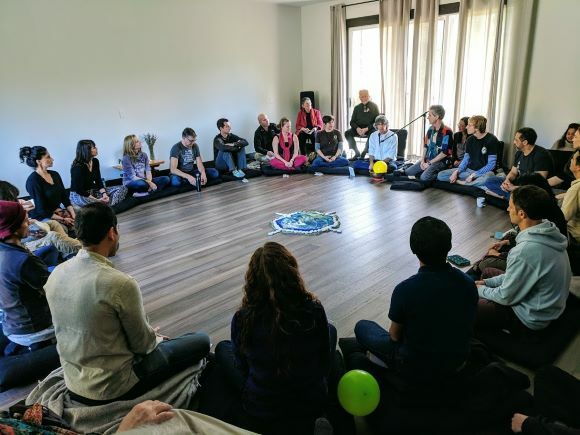 At 9:00 all forty participants filed into the zendo, sat in a circle, and settled onto zabutons for an hour of meditation. An hour later, Nipun struck the singing bowl three times to conclude the hour sit. There followed a sharing of reflections on the experiences from the previous day’s session. After the sharing, I was introduced and took a seat in the main circle. When I sat down on the cushion and settled into a full lotus position, I felt an incredible wave of love beamed at me. All of my nervousness just washed away. The genuine smiles of these kind people let me know everything was going to be good. I began by saying this was the group I had waited all my life to work with. It wasn’t an exaggeration. After thirty-five years of teaching, I finally get to work with people who live their lives based on pure love and generosity. Wow! I fed off of their energy and the workshop ran almost effortlessly. I had prepared the plan for the day in detail, but the collective energy of the group took over and carried us. I shared my experience at The Parliament of the World’s Religions in Barcelona, Spain. Every day at noon, in a makeshift Gurdwara, the Sikh community fed the 7,000 people who attended the Parliament. They did this as an offering, expecting nothing in return. They received no grants to purchase the food, and the meals they served were free for all the participants. One afternoon, while enjoying a delicious vegetarian lunch in the Gurdwara, seated beside Muslims, Jews, Hindus, Sikhs, Jains, Buddhists, Christians, I had a revelation that all things were possible. It’s possible to feed the hungry. To house the homeless. To put an end to war. It’s possible for people of all religions to break bread together and live in peace. All it takes is the commitment of groups like the Sikhs and ServiceSpace to roll up their sleeves, say “yes,” and begin the work of transforming the world. After my opening remarks, I told a Paiute story about a time in the ancient past when all living things spoke the same language. Sadly, that common language was lost due to division and fear. Yet today, despite our differences, we are still able to speak with our hearts to one another through the language of stories. And I said that was exactly what we were about to do. We traced the roots of storytelling all the way back to our tribal ancestors who told stories around the fire for the purpose of uniting the tribe around a common message. Now, all these thousands of years later, here we sat, around a modern day fire -- four small candles (not to mention the fire in our hearts!) -- united around a message of hope for a better world in the service of others. We discussed the oral tradition and how stories had been handed down by word-of-mouth to our present day. Our goal for the day would be to craft a “New Story” that envisions the future and serves as a map for our lives moving forward. But enough of theory! Time to walk the talk! We jumped to our feet and built bridges with our bodies. Physical bridges that were simultaneously figurative bridges connecting two human beings in a spirit of community. We made several bridges, then partnered up and discussed ways we can build bridges in the real world. Then we engaged in a series of one-on-one storytelling interactions on topics such as: Making a difference with your work. The impact words had on you, or your words had on another. People who have made a difference in your life. After a short break, I told an Irish story about the strength of working together. Then it was play-time again as we went outside and broke up into groups of six, locked arms and played a game in which the object was to keep a balloon afloat through teamwork. Back inside the zendo, we shared stories of solidarity and teamwork. Then each person was asked to reflect on the story of their past—their personal journey, their family story, their cultural story. I asked them to tell this story in the third person. The third person perspective gave the activity an unexpected power, as many of the participants were moved to tears. The objectivity of the third person created a distance between the teller and the story that engendered a profound empathy that stirred up a surprisingly emotional response. The third person perspective created a kind of detachment that allowed the tellers to suspend judgment and reflect on their personal stories from a fresh point of view. Lunch on the outdoor patio was a joyful sharing of animated conversation and vegan food, prepared by sisters Sandy and Helen. At 2:00 we returned to the zendo to complete our work. I began by telling my revisionist version of The Three Little Pigs. In this version, the first pig builds a mansion out of greed; the second build a fortress out of anger. Since both of the houses are built on a shaky foundation they’re easily blown down. The third pig builds his house out of compassion. Since it’s built on a solid foundation, nothing can bring it down. And he and his family live…happily ever after. Ah, if only it was like that in real life. But wait. We’re talking about the ServiceSpace community here! If anyone can turn a fantasy into reality they’re the ones to do it. And so they did. In small groups (Never underestimate the power of a small group of committed individuals!) they spontaneously crafted stories that built a bridge from the past to the future. Stories full of hope and optimism. Stories that were part affirmation of wisdom and part visualization of the change we’d like to see in the world. Initially they told these stories in groups of four. 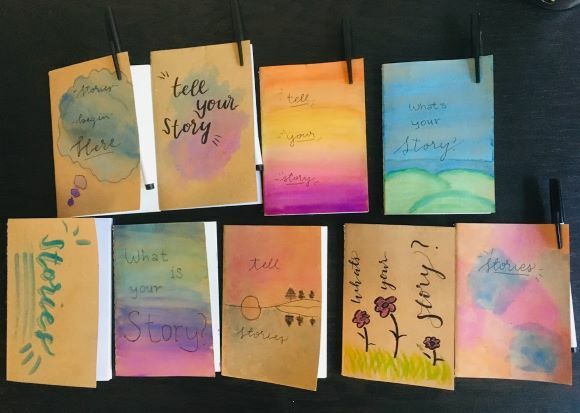 Then, after the entire group reconvened back in the zendo, participants were asked to recommend those storytellers whose stories should be shared with everyone. Wouldn't you know it, these kind folks chose some of the shyest, softest-spoken members of their groups to share. People who didn’t demand to be heard, but whose voices stood out for that very reason. By the time the final story settled into silence, each of us had created a new story for a new world. A story that will live and breathe and continue to be revised and actualized through the ongoing process of our spiritual practice. Outside of the zendo is a pathway that winds around the Banyan Grove. Nipun explained the practice of three steps, one bow, and suggested we give it a try. The tradition is hundreds of years old, practiced by sages in China and India. It was inspired most recently by the example of our Dharma friend, Buddhist monk, Reverend Heng Sure, who completed a 900 mile pilgrimage from Los Angeles to Ukiah between May 1977 and October 1979 in which he made a full prostration to the ground every third step, palms turned upward. All forty of us lined up single file on the pathway outside the zendo. We bowed around the grounds of the Banyan Grove in silence for forty minutes. Later, Rick, who drove me here, stated that the power of the practice was so immediate, that he burst into tears upon the very first bow. When the final collective imagine was voiced, we rose as one and wrapped our arms around each other. Then Nipun led us into something he calls the cinnamon roll. Like a cinnamon roll, the circle curled up into a massive group hug in which everyone was physically and spiritually close. Love abounded and unrestrained smiles filled every face. After one of the longest goodbyes I can ever recall -- no one wanted to leave! -- we hiked down to our cars, taking with us the bliss of the retreat and the intention to pay that joy forward to all living beings who weren’t able to attend. Each of us left with a new story to tell. And plenty of work to do before the story ends. Beautiful to see such unfolding of stories and birthing of dreams in Banyan Grove. Deep bows to everyone who made this retreat possible and so special. What an amazing, joyous and life-affirming day that was! So honored to be able to transport Brian to and from that magical day! 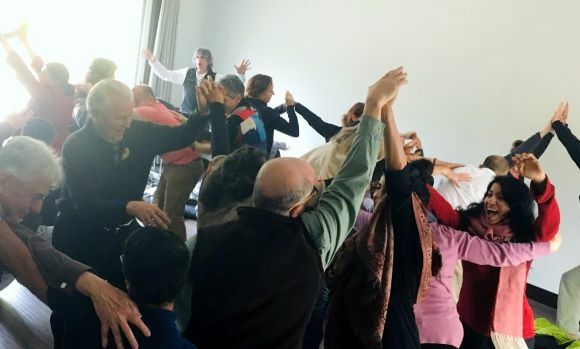 Brian Conroy has taught a Story-telling Circle at the Berkeley Buddhist Monastery for years and has changed lives in the process. His skills deserve a wider audience. What gifts he gives! How beautiful. Thank you for writing this story and sharing it here. I felt almost like I was there. ♥. Looks beautiful, can't wait to see it one day! What a joy to feast in Brian's beautiful, touching stories and to share our own with each other. Sharing stories in the way Brian guides us reminds us that we are all living poetry. So appreciating all of you that made this magic happen... looking forward to more! Wow! It sounds like a most wonderful event! !